(Avens, White (Geum canadense) - 01) White avens are members of the Rose family, Rosaceae. They usually grow to heights of 18-30 inches, and bloom from June to August. 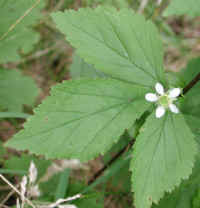 The white avens is native to North America. 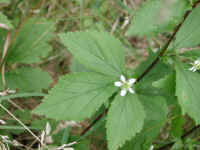 (Avens, White (Geum canadense) - 01a) The lower leaves of the white avens are divided into three to five toothed leaflets. 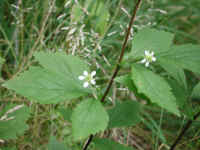 The white avens flowers grow terminally at the end of branching stems that develop from the leaf axils. (Avens, White (Geum canadense) - 02) We have wondered about some of the differences we have observed in white avens plants that were not mentioned in the literature: the main stems were a deep reddish color while the branch stems were green, and the stems and underside of the leaves were hairy. 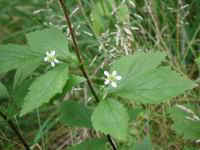 The flowers of the white avens are about 1/2 inch across, with 5 rounded white petals and 5 pointed green sepals of the same length. 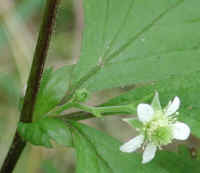 As the flowers mature, the sepals curl downward, so that they may have to be lifted to verify that they are approximately the same length as the petals. 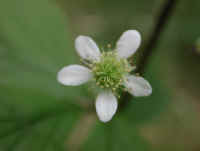 White avens flowers also have numerous stamens and numerous pistils with hooked styles. (Avens, White (Geum canadense) - 03) When the white avens go to seed, they form round balls with hooked spines that cling to clothing and animal fur. We believe the hooked spines are the dried pistils. (Avens, White (Geum canadense) - 04) This is a closer look at a white avens seed pod. (Avens, White (Geum canadense) - 05) In this photo, we have a closer look at the hooked ends on the spines of the white avens seed pod. 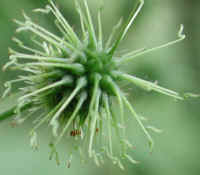 We believe that the shorter non-hooked projections are the dried remains of the stamens. (Avens, White (Geum canadense) - 06) We recognize that most people find the white avens seed pods to be an annoyance because of the way they stick to their clothing, but we still have to wonder at the artistry of design that was created into this plant to insure that it would reproduce and spread. (Avens, White (Geum canadense) - 07) This is an example of a white avens flower whose sepals don't project out between the petals. They have curled downward. (Avens, White (Geum canadense) - 08) Even though people may find the white avens' seed pods to be annoying, the flowers are still pretty. 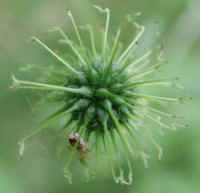 Also, in olden days the roots of this plant were harvested and used to add an agreeable taste to beer and ale. Native Americans also made the roots into a tasty beverage which they believed would treat problems of the stomach and bowels.